Is my nem getting ready to split? 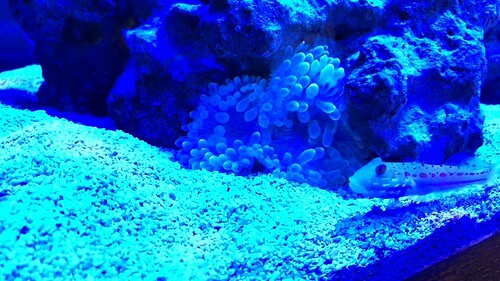 This is my first anemone, so I'm learning as I go. I've had him about a week, and he hasn't attached to anywhere on top of the rock. He's happy to stay planted in the sand against a rock. Occasionally I see him closed up, but mostly he's wide open and fully-colored (the picture doesn't do justice). I fed a bit of brine shrimp earlier (my first feeding) and he seems to have taken it. 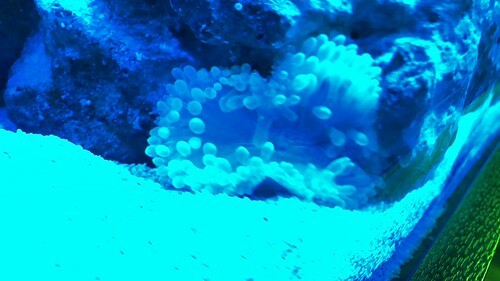 My nem is sitting in a bit of a figure 8 shape. Does it look like he might split? Can you get some pictures with your blue lights off? It's really hard to judge the health of a nem when you can't see it's true color. I don’t think it’s splitting just the shape of it as it sits against the rock n sand. But I do think your bta maybe bleached to me and I would feed it mysis instead of brine shrimp once a week.